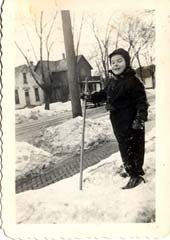 Here is a pic of my dad in the snow in their front yard. This 2nd pic is of he and his brother. In the background there is a smoke stack, water tower, and the roof of a train station. Both of these pics are from the early 1940’s. This next picture is something that amazed me when I first saw it. 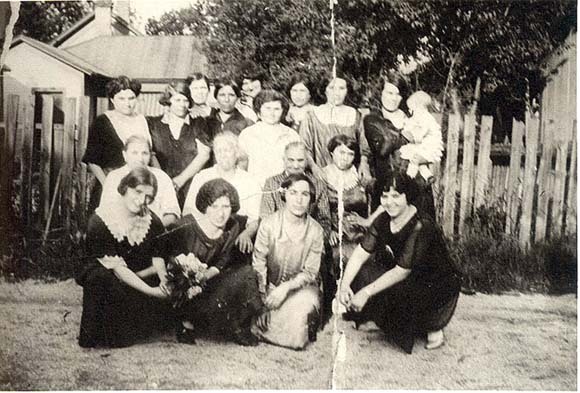 It’s not very good quality, but near the center of the pic is my great grandmother. I had no idea that she ever came over from Sicily. My Father, John Mallo Manalli, was born December 18, 1899 in Santa Cristina, Sicily now combined with Piana Di Greci and known as Piana di Albanesi because most of the inhabitants are of Albanian descent many of whom still speak Albanian which was my Father’s first language. He only began to learn Italian when he started school. His Mother was also born in Santa Cristina, but his Father, Giacchino, was born in Piana di Greci. In 1902 John emigrated to America and joined his Father and older Brother Henry who had emigrated two years earlier in New Orleans. They later moved to Rockford, Illinois where he grew up and where the rest of the Family joined them. When he was 21 he moved to Racine with his younger Brother Sam wherein 1926 he met and married my Mother, Stella James whose Mother immigrated from Denmark and whose Father, of Welsh descent was born in Michigan. I was born in Racine on June 29th, 1931.